The asteroid belt is a collection of rocks between planets Mars and Jupiter. Some of these rocks are classified as asteroids. Some are minor planets. One of them, Ceres, was recently promoted to be a dwarf planet. About half the mass of the asteroid belt is concentrated in four objects: Ceres, Vesta, Pallas, and Hygiea. Ceres is about 1000 km in diamter. The other three are about half that size. The remaining objects are small, down to the size of a dust particle. A German astronomer Johann Daniel Titius, noted an apparent pattern in the layout of the planets. If you start at 0, and included 3, 6, 12, 24, 48 (doubling each time), than added 4 to each number, and divided by 10, that would produce a remarkably close approximation to the distances of planets from the Sun. That pattern is now known as the Titius-Bode law. And that law predicted the semi-major axises of the six planets known at the time (Mercury, Venus, Earth, Mars, Jupiter and Saturn), provided you allowed for a gap between Mars and Jupiter. In 1766, in his footnote to the book Contemplation de la Nature, he declared, "But should the Lord Architect have left that space empty? Not at all". There is no scientific consensus on why the law works. It's just a good indicator of design. When Uranus was discovered in 1781, it's orbit matched the law almost perfectly. That led astronomers to conclude that there must be a planet between Mars and Jupiter. A number of astronomers were assigned to a task of searching the skies for the missing planet. In 1801, an object was indeed found at the exact location predicted by the Titius-Bode law. It was called Ceres. 15 months later another object was discovered in the same region. They called it Pallas. Unlike the other planets, the objects looked like points of light, even under the biggest amplifications of telescopes at hand. So they were dubbed asteroids, after Greek asteroeides, meaning "star-like". Discoveries of other objects followed at an accelerating rate. Contrary to science fiction imagery, objects in the asteroid belt are very far apart from each other. Many pictures we have of asteroids came from flying spacecraft through the asteroid belt. The odds of a probe running into an asteroid while flying through the belt is estimated at 1 in a billion. 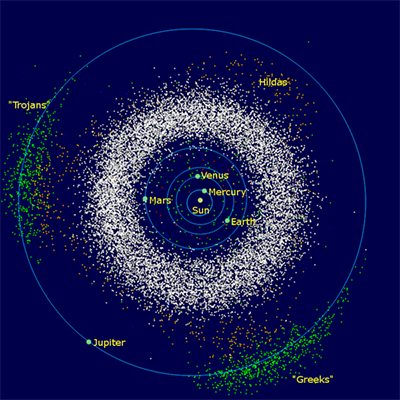 Over a large volume, however, there are a lot of asteroids in the belt. Scans of the belt in the infrared wavelengths has shown that there are 0.7-1.7 million asteroids 1 km or more in diameter. The total mass of the asteroid belt is estimated at 2.8X10^21 to 3.2X10^21 kg. Half of that mass is taken up by the four largest objects in the belt, Ceres, Vesta, Pallas, and Hygiea. Ceres alone comprises 1/3 of the total mass.